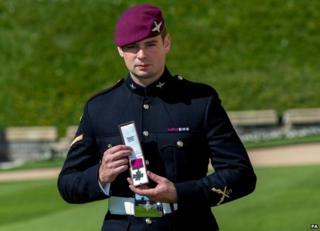 A paratrooper has become the first living British serviceman to receive the Victoria Cross for service in Afghanistan. L/Cpl Joshua Leakey, 27, of the Parachute Regiment, twice came to the aid of a wounded US Marine Corps captain whilst under enemy fire. He also helped forces regain the initiative after being pinned down and surrounded in Helmand province in 2013. He received the medal from the Queen at a ceremony at Windsor Castle earlier. L/Cpl Leakey, from Hampshire, said he was "deeply honoured". He has been recognised with the VC almost 70 years after another member of his family was awarded the same honour. L/Cpl Leakey's second cousin twice removed, Sergeant Nigel Gray Leakey, was a posthumous recipient of the VC in November 1945, for his actions while fighting in Africa during World War Two. The Victoria Cross is the highest award for gallantry in the presence of the enemy. In August 2013, after dismounting from helicopters, a group of UK and US forces came under attack from around 20 insurgents armed with machine guns and rocket-propelled grenades. He returned to the injured captain - drawing enemy fire again - to retrieve a second machine gun, before running back to the crest of the hill, where he managed to help regain the initiative. L/Cpl Leakey told the BBC: "In that particular incident I was in the best position to do that. If it had been any of my mates they would be in this position now. "I don't look at it about being about me in particular, I look at this as representing everyone from my unit, from my battalion, who was involved in the campaign in Afghanistan."